Home » RED BOOK » definition gauge evaluation » What is gauge evaluation? Gauge evaluation is to identification of errors in measurement, variability and accuracy by observation & determines measurement system. Gauge evaluation is conducted to identification of errors and mistakes of the regular use gauges that part of the measurement system are used in quality assurance and quality control department, through gauge evaluation by observations of few qualified peoples i.e. quality engineers are conducting & establish of process of gauge evaluation of measurement system. Gauge evaluation is testing the measuring instruments for variability; attribution and accuracy through observation conducted by some quality engineers are attributing measuring instruments by visual, observations & statistical calculations to determine results to improvements in gauge measurement system to ensure quality system for product and its dimensions. Gauge Evaluation is conducted by qualified quality engineer shall be responsible for performing gauge evaluation and implementation of the procedure, gauge measurement system for quality system & product quality maintain & enhancement. Quality engineers should be well experience and qualified for the conducting this process for acquire refined system by carry out gauge evaluations on present measurement system. How to carryout Gauge evaluation? To obtaining sophisticated measurement systems and improvement, periodic gauge evaluations carry out on current measurement systems. 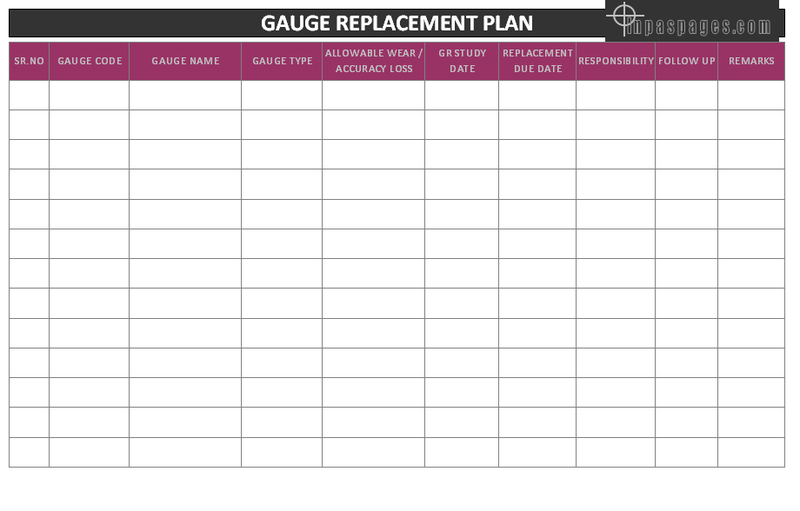 The task of the gauge replacement program for quality engineers and department head are prepare the planning, quality engineer should identify the list of attribute and variable gauges to perform replacement program on base of the replacement planning. All the gathered appropriate data to the performance of gauges by gauges / instrument records, maintenance of gauges & gauge repeatability and reproducibility study reports are generated, verify and approved. Correlation study ( There are many types of method but least squares for line fitting method is usually helpful for industrial uses) for variable gauges, attribute gauges & accuracy loss analysis are conducted by quality engineers. All the gauges shall be proper reviewed, gauges present status that available with quality / production department & use for the performing measurement task should be inspection by measurement and testing equipment to ensure the gauges are accurate & functional for routine performances. All the collected information from the various analysis, quality peoples shall prepared documents for the perform gauge replacement planning, in the analysis some basic requirements like projection and time frame are cleared for the replacement on due date. The quality engineers are collecting the information and data of available measurement systems for analysis, for the improvement quality peoples can analysis data to identify advance measuring system for the product requirements, to controlling on the process of plant / machinery acquisition, in case any customers are expecting more that need to plan for the improvement. Quality peoples are establish gauge improvement plan by preparing documents to comply further needs and requirements, all the gauge improvement points are conducted as per plan for the implementation plan and necessary changes for enhancement level of gauge studies. 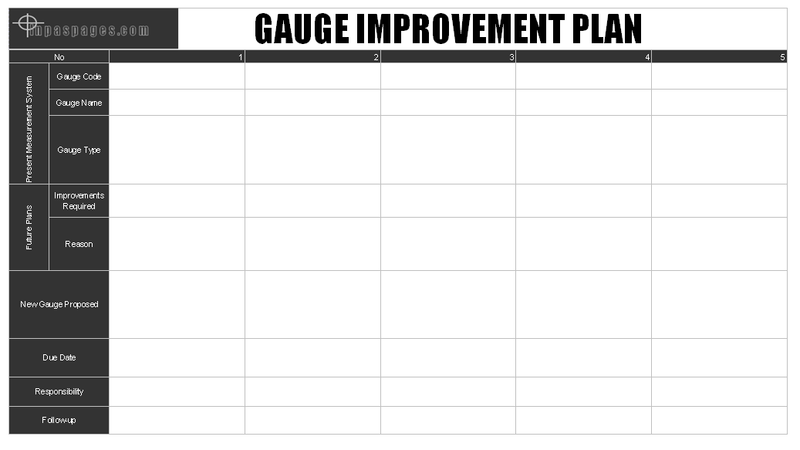 Gauge improvement should include & clear identified requirements of resources, assignment of responsibilities and possible time frame (Schedule).